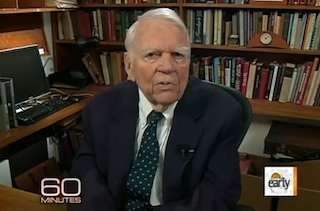 Broadcasting legend and 60 Minutes fixture Andy Rooney died Friday night in a hospital in New York City. Rooney had only made his final sign-off as a weekly commentator on the CBS show just over a month ago, and was reportedly in stable condition following complications from minor surgery last week. This is a moment I have dreaded. I wish I could do this forever. I can’t though. But I’m not retiring. Writers don’t retire and I’ll always be a writer. A lot of you have sent me wonderful letters and said good things to me when you meet me in the street. I wasn’t always gracious about it. It’s hard to accept being liked. I don’t say this often, but thank you. Although if you do see me in a restaurant, please, just let me eat my dinner.